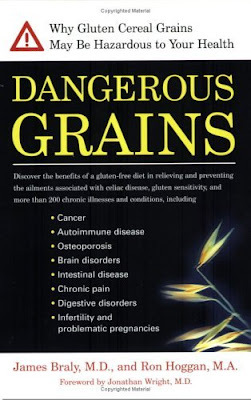 Dangerous Grains is about the health hazards of gluten grains. It's co-written by James Braly, an M.D. who specializes in food allergies, and Ron Hoggan, a celiac patient who has written widely on the subject. Celiac disease is a degeneration of the intestinal lining caused by exposure to gluten. Gluten sensitivity is a broader term that encompasses any of the numerous symptoms that can occur throughout the body when susceptible people eat gluten. The term gluten sensitivity includes celiac disease. Gluten is a protein found in wheat, its close relatives (kamut, spelt, triticale), barley and rye. Wheat is the most concentrated source. An estimated one percent of the U.S. population suffers from celiac disease. Approximately 12 percent of the US population may suffer from gluten sensitivity, according to blood antibody tests. Gluten can damage nearly any part of the body, including the brain, the digestive tract, the skin and the pancreas. Sometimes gastrointestinal symptoms are absent. Both celiac and other forms of gluten sensitivity increase the risk of a large number of diseases, such as type 1 diabetes and cancer, often dramatically. The majority of people with gluten sensitivity are not diagnosed. Most doctors don't realize how common gluten sensitivity is, so they rarely test for it. Celiac disease and other symptoms of gluten sensitivity are easily reversed by avoiding gluten. That's an enormous disease burden coming from a single type of food. I suspect the true incidence may actually be higher, although it's difficult to be sure. Dangerous Grains also discusses the opioid-like peptides released from gluten during digestion. Opioids are powerful drugs, such as heroin and morphine, that were originally derived from the poppy seed pod. They are strong suppressors of the immune system and quite addictive. There are no data that conclusively prove the opioid-like peptides in gluten cause immune suppression or addiction to wheat, but there are some interesting coincidences and anecdotes. Celiac patients are at an increased risk of cancer, particularly digestive tract cancer, which suggests that the immune system is compromised. Heroin addicts are also at increased risk of cancer. Furthermore, celiac patients often suffer from abnormal food cravings. I know several people who have benefited greatly from removing gluten from their diets. Anyone who has digestive problems, from gas to acid reflux, or any other mysterious health problem, owes it to themselves to try a gluten-free diet for a month. Gluten consumption has increased quite a bit in the U.S. in the last 30 years, mostly due to an increase in the consumption of processed wheat snacks. I believe it's partly to blame for our declining health. Wheat has more gluten than any other grain. Avoiding wheat and all its derivatives is a keystone of my health philosophy. Another notable change that Sally Fallon and others have pointed out is that today's bread isn't made the same way our grandparents made it. Quick-rise yeast allows bread to be fermented for as little as 3 hours, whereas it was formerly fermented for 8 hours or more. This allowed the gluten to be partially broken down by the microorganisms in the dough. Some gluten-sensitive people report that they can eat well-fermented sourdough wheat bread without symptoms. I think these ideas are plausible, but they remain anecdotes to me at this point. Until research shows that gluten-sensitive people can do well eating sourdough wheat bread in the long term, I'll be avoiding it. I have no reason to believe I'm gluten sensitive myself, but through my reading I've been convinced that wheat, at least how we eat it today, is probably not healthy for anyone. I'm not aware of any truly healthy traditional culture that eats wheat as a staple. As a matter of fact, white wheat flour has left a trail of destruction around the globe wherever it has gone. Polished rice does not have such a destructive effect, so it's not simply the fact that it's a refined carbohydrate. Hundreds, if not thousands of cultures throughout the world have lost their robust good health upon abandoning their traditional foods in favor of white flour and sugar. The medical and anthropological literature are peppered with these stories. Overall, the book is well written and accessible to a broad audience. I recommend it to anyone who has health problems or who is healthy and wants to stay that way! What evidence is there that fermentation breaks down gluten? I've looked for evidence that fermentation might break down casein, but so far I've come up with nothing. I'm skeptical about Fallon's assertions. Thanks Stephan for another thought provoking post. It sounds like a fascinating book. This is an interesting site. Elaine Gottschall's book Breaking the Vicious Cycle is thought provoking. Elaine proposes the problem is bigger than gluten and amounts to a depleted digestion that is unable to handle certain complex carbohydrates, leading to bacterial overgrowth, and immune response to bacterial toxins creating a thick layer of mucus which impedes digestion so starting a vicious cycle. - Elaine's treatment is a paleo type diet. Excess Omega 6 (combined with lack of Omega 3)sensitises the body to allergens and contributes to inflammation and oxidative stress, and so poor digestion, and is observed in IBS and co-conditions. Add undigested refined sugars, nutrient depleted and refined food, lower antioxidants in grain fed restricted diet livestock etc, chemical treatments of grains in storage, lower nutrient grains, depleted mineral soil, less effective fermentation / cooking / soaking baking, and are we setting the body up to be more than usually sensitive to potential allergens? Is it the fermentation per se, or simply being wet for a time? Try taking some whole wheat berries and soak them. 8 hours is enough to soften them considerably. 3 is a bit low. Questions: How much of the inherent enzyme activity of a whole wheat berry survives the grinding process? How much did survive old fashioned grinding techniques vs. modern roller-milling? Do you need whole wheat to get any innate enzyme activity from such soaking? These questions strike me good cheap research proposals for a small university. Could even involve some undergraduates. Just curious, Stephan, what made you choose this book over the many others that detail the downsides of grains? This is a bit off-topic, so apologies in advance. Stephan, I've been a reader of your blog for a few weeks, but I've read almost all the old posts and really enjoy everything. Thanks for it. My question pertains to celiac in infants. We have a 7 month old and we've been struggling with him basically the whole time. He's underweight, and seems unhappy a lot of the time. He seems to have some kind of pain in his gut that makes him not want to eat. We've considered a lot of possible causes and seen a lot of doctors, but no resolution or diagnosis yet. Anyway, last week he tried wheat for the first time and got very sick afterwards. Now, it appears that it was just a cold which happened to coincide with the wheat exposure, but it still got us thinking about celiac's. A lot of his other symptoms seem to fit. But it wouldn't really make sense unless it is possible for gluten to pass through to the baby in breast milk. We've read in a couple of places that this isn't possible (or at least isn't normal? ), but we've also seen some hints elsewhere that maybe it is possible and also know not to trust conventional wisdom on certain things like this. Does anybody know if this is possible (i.e., if gluten can end up in breast milk)? Or more generally, does anybody know of any good sources of info on celiac's or gluten intolerance in infants? Dr. William Davis in his Heart Scan Blog has repeatedly said that getting his patients to stop eating wheat is one of the most effective interventions for reversing his patients' atherosclerosis (as measured by heart scans). Clearly it's effective for far more than 12% of his patients, and wheat seems to have more impact than most other carbohydrate sources. My speculation is that lectins or other ingredients in wheat mess up most people's metabolisms, above and beyond the effects of the carbohydrate itself. The "evidence" I'm aware of is mostly anecdotal. Some people with gluten sensitivity say they can tolerate long-fermented sourdough bread. If there are hard data on the effect of fermentation on gluten, but I'm not aware of them. I haven't looked very hard though. I wasn't able to access the link you posted, but I found Gottschall's website. It looks like a low-carb paleo diet. I'm sure it's a very healthy diet, although perhaps a bit too restrictive. If I understand correctly, she doesn't allow starchy tubers. They have been a part of the human diet since the beginning, so I don't see the point in restricting them unless you have glucose control problems. It's both. Even if not fermented, grains will break down some of their own anti-nutrients when soaked. I believe at least some of those enzymes survive milling, and I believe they are also present in the endosperm, so even polished grains can benefit from soaking. I chose Dangerous Grains because it focuses on gluten grains specifically. I think gluten grains are in a class of their own, whereas other grains can be healthy in moderation if they're treated properly. I also liked the book's focus on autoimmune diseases. If you have recommendations for other books on grains you've enjoyed, I'd be interested to hear them. I can't imagine any significant amount of gluten comes out in breast milk, but I don't really know for sure. If you are gluten-sensitive, you will be passing anti-gliadin antibodies on to the child in the milk, but I don't believe that's a problem. Definitely keep breast feeding! Just try to make your milk as nutritious as possible with nutrient-rich animal foods (focus on fat-soluble vitamins and long-chain omega-3s; cod liver oil is a good source) and mineral-rich vegetables. Keep your vitamin D status good and you'll be passing it on to the child. Absolutely. I follow Dr. Davis' blog and I agree that there's something special about wheat. I've come to the same conclusion from a totally different angle. I think the lectin theory is very plausible. I've written about it several times, you can find it if you search for the "leptin and lectins" series. Gluten is a lectin as well. There are lectins in potatoes and root vegetables also. Just because they've been in the human diet for millions of years doesn't mean they are optimal for health. Being the opportunistic survivalist eaters we've always been, we may have incorporated them into our pre-agricultural diet by "accident", kind of the same way we hit upon eating grains and wheat. If lectins are bad for us, I would think taking out root vegetables from the diet would be just as helpful as taking out grains, no? So I think both need to be grouped together for optimal health. Speaking of root vegetables/starches in your diet you listed strachy veggies as the second most eaten in terms of volume. Just curious to know if you monitor grams of carbs/day ? A daughter with digestive problems was Elaine Gottschalls starting point. The recipes include butter and exclude vegetable oils except olive so it is a low Omega 6 diet which will reduce inflammation. Is the explanation in the book the whole answer - I am still trying to understand why some foods were excluded, but presumably based on her own observations - and does not ultimately care if it works? As Stephan suggests fish oil is key to development as well as reducing inflammation. Trials show that the benefits of fish outweigh the downsides of pollutants in fish. Omega 3 intake recommendations in pregnancy vary but a trial suggests up to about 3grams a day 1.5 EPA and 1.5 DHA is fine - but mention it to your doctor and in advance if on any blood thinning medication. Increased Omega 3 DHA and EPA obtained in breast milk should help reduce any allergic tendencies in the baby. Will changing the mothers wider diet help? Self evidently the mother diet will alter breast milk composition, and in the absence of anything else it has to be worth a try in conjunction with discussions with medical advisers. There are lectins in everything, even in our own cells. The question is, which lectins are harmful and which are not? I would argue that the lectins we've been eating for 2 million years are less harmful than those we've been eating for 10,000 to 50 years, depending on genetic lineage. I think this is corroborated by the fact that healthy traditional cultures typically go to great lengths to inactivate grain lectins. I don't monitor, I just go by what feels and tastes good. I think last time I checked, I was eating about 30% of calories from carbohydrate. That's about 225 grams of digestible carb per day. I typically get it from root vegetables, legumes and fermented non-gluten grains. Yes there are lectins in everything, and plenty in the copious amounts of high fat dairy products I eat daily. But I would argue that those lectins are made to be ingested by another animal (in this case, a calf) and hence they are digestible and non-toxic, while the lectins in plants are intentionally toxic in order to serve as an natural insecticide. Maybe this insecticide is not harmful to us. It could have been made to ward off an animal which went extinct long ago. Dunno. And of course, I have no proof of this. But from an evolutionary perspective, it would make more sense for a plant to hate a mammal tha a mother mammal to hate her mammal child. Actually we could use this logic to argue against the eating of all plants (and for that reason I really try to minimize them in my diet). I agree with you that the oldest human cultures seem to be doing okay on root vegetables. And they seem to know the dangers of grain lectins and treat them accordingly (if they eat them). I think there's a case to be made for distinguishing between the definitions of animal and plant lectins, in any case. What they actually do to us (separately) would be an interesting study. The above article details a doctors use of nonhydrogenated, extra-virgin cocnut oil to improve (yes, improve) her husbands battle with Alzheimers! Fats known as ketone bodies can substitute as an energy source for brain cells affected by Alzheimers - which is caused when certain brain cells can no longer metabolize glucose and begin to die. Interesting. I wonder if he could have avoided the disease altogether if he had eaten it for his entire life. It's interesting how they put the warning at the bottom about eating coconut oil. They couldn't keep themselves from fear mongering. Make sure to consult a physician before drinking water too. It's true that plants don't generally want to be eaten (except some fruit), but it's clearly possible to be adapted to plant foods, as many herbivores are. It's just a question of what your physiology is adapted to tolerate. 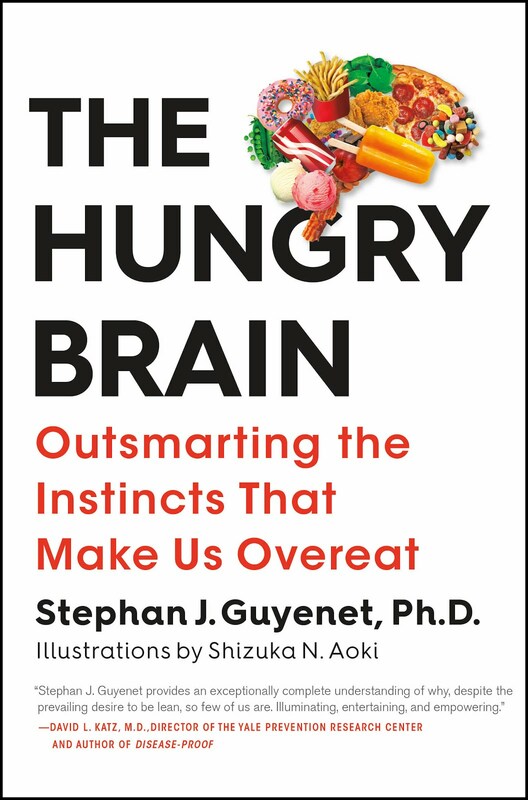 Are our big brains connected to eating meat? If so, then our digestion would certainly be too. It doesn't necessarily mean plants are bad for us, but it could mean we haven't developed neutralizers for plant toxins and so are especially sensitive to them, more so than ruminants and even our cousin apes. "Dr. Veech has been working with ketones for more than 40 years and has become a valuable resource to the Newport family. Currently, he is working for the military, looking into ketones as a way to improve the performance of troops in severe conditions." Thank for posting that link fascinating. But it asks many questions,and from this comment is it an attribution of cause rather than positive determination. "Much of the benefit of KB can be attributed to their ability to increase mitochondrial efficiency and supplement the brain's normal reliance on glucose." It seems to me that a change to a ketone based diet is going to have a mass of consequences for the metabolism including on the Omega 6 downstream pathways and oxidative stress. The most surprising part is the speed of the effect based on the report of progress in your link. Interesting it works for diabetes, so may be fuel for the brain cells is only a part of what is going on (assuming diabetes does not originate in the brain cells(-: ). It looks like they have been working in this for a while. A ketogenic diet is used with success in treating children with epilepsy. From related research it is known that a ketogenic diet increases the number of mitochondria in the hippocampus, a region of the brain significantly affected by Alzheimer's. This increase along with other ketogenic diet activated genetic expression leads to improved energy metabolism in the hippocampus. I think there is more than a mere coincidence here between epilepsy treatment and Alzheimer's improvement, and that there is much to be learned here. I think that's true. We can't live on leaves and bark alone. We're clearly omnivores, and we'll eat lots of animal foods if they're readily available. I think it's worth noting though that plant foods occur in human archaeological sites. I love this blog, and the thoughtful discussion afterwards is fascinating. 1) Can anyone point me to a summary of which grains carry what level of lectin / gluten load? Sort of like a nutrition data table, just focusing on lectins & glutens. 2) I've been thinking about diet composition and it seems like we could live for the rest of our lives, just fine, without eating another gram of carbohydrate, but we would die shortly if we managed to stop consuming protein or fat. Thoughts? #2 - you're pretty much right, but remember it's darn hard to consume zero carbs unless you exist on mostly fat with enough protein, particularly organ meats. Even muscle meat has a bit of carb as glycogen. Non-starchy plants provide carbs, too, and that's probably plenty without wreaking havoc on glucose regulatory system, but you'd never know that from the conventional diet/nutrition wisdom and Madison Avenue promotions. #1 is difficult to answer, because the health effects of lectins are determined by the type of lectin as well as quantity. As a matter of fact, I'd say type matters more than quantity. Many lectins are broken down by cooking, further complicating it. My approach is to use traditional processing methods that have been proven over generations to make grains healthy. Gluten is found in wheat, barley and rye, with the most being in wheat. The quantity of gluten also varies with the type of wheat, with the most found in bread flour and the least in cake flour. As Anna said, we don't strictly need carbohydrate, but we do need protein and fat. Our absolute requirement for fat is pretty low as well though, just the essential fatty acids. If I had to choose between fats and carbohydrates though, I'd definitely choose fats. I don't think a very low-fat diet (10%) is a good idea in the long term. Which grains, according to your thinking, are most benign for human consumption when bought off the shelf of the average grocery store? The reason I ask is that I have a three-year old daughter who loves carbohydrates. I've read Taubes' "Good Calories, Bad Calories" and have tried to reduce carbs and polyunsaturated fats and increase consumption of animal products and animal fat as well as monounsaturated fats. But, my daughter is a carb lover. She loves "gold fish", crackers, pasta, etc. She will barely eat meat, though she will eat eggs, cheese, and butter which I give to her as often as possible. She has never tasted a soda and drinks exclusively water and whole milk (from cows) and the occasional juice. But I'm still stuck sending her off to day care with a sandwich or pasta in her lunchbox. I've been using whole-wheat bread, but given what I've read in this post would like to find an alternate sandwich material that I can buy off the shelf. I also have a two-month old at home, so I don't have time to soak or sprout grains. What should I buy? Oat bread? Corn tortillas? Rice products? What? Is there an empirical basis for choosing one type of grain over another? Wheat is the most noxious because it has the most gluten. Quick-rise (standard) whole wheat is the worst. Other gluten grains include rye and barley. Anything that makes a decent bread, unfortunately! Corn is probably better than wheat (make sure it's nixtamalized (called "masa flour")), and rice is the best. If you aren't going to soak it, go for white rice. Make up for the nutrients lost in refining by eating vegetables and meats. Soaking really takes no time whatsoever though. Just a thought in advance. If you can't part with bread, sourdough rye is the best. I don't think carbohydrates are really a problem per se. The problem is specific types of carbohydrate foods: sugar, wheat and industrially processed grain foods. Rice, root vegetables and properly prepared non-gluten grains are the best sources. It sounds like you're moving in a positive direction! Thanks for tips, Stephen. After reading Good Cals, Bad Cals, my family switched from white rice to brown rice, which my wife (Chinese) cooks in the rice cooker. Should we soak the brown rice before cooking it? If so, for how long? Btw, we discovered that brown rice lends itself to a much tastier stir-fried rice with a much nicer consistency than does white rice! Who would have thought with the ubiquitous use of white rice in Chinese cooking. Yes, I recommend soaking brown rice before cooking. I usually soak it about 12 hours but that's probably overkill. 6 hours is fine, and the warmer the water (not exceeding 115 F), the faster it will soak. Adjust cooking water accordingly. I agree with you, brown rice is delicious. I think it's even better soaked. It becomes milder and slightly sweet. I'm in the trenches with a carb-loving kid, too. Don't despair, Rome wasn't built in a day, nor did it tumble that fast. But do be sure to keep an eye on where you can make effective changes at various stages. Your children at at an excellent stage to make some changes. And you will make one change, only to reverse yourself or try out another idea when you learn more. That's bound to happen. I made my own dietary changes first, starting when my son was about 5 yo. He had been regularly consuming homemade bread, bread puddings made with leftover bread, and all sorts of other starchy side dishes, though I never put him onto much juice (I recognized that sugar bomb years before he was born). he loves his carbs and they were so easy to feed them to him. So I cleaned up my own diet first (& my husband's), then bit by bit, worked on my son's, because he had become very picky after his first few toddler years of eating just about anything. I'm very pleased with what he is willing to eat now and what he recognizes as less healthy to consume, though it has been a bit rocky at times. But I'm of the mindset that I have his long term interests at heart, not his immediate whims, so overall, I determine what is available to eat in our house. I put a prominent note on our fridge door when my son was learning to read (though it was a reminder for all of us) - The Food You Put in Your Body Becomes Part of You. He is learning that sure, food is tasty and enjoyable, but it is also important for our bodies. The biggest change for me was realizing that over 6-7 years I had slowly moved towardseating and feeding the family too many processed foods (I found Trader Joe's more sophisticated processed heat & serve junk simply too seductive when I moved to CA). Both my husbnad and I had gained some weight - not huge amounts, but still, too much. I re-prioritized and got back in the kitchen and cut our carbs. I found all the LC cookbooks that were out then reinvigorated my cooking urges (when I had to eat LC while pregnant 10 years ago, I didn't have any good cookbook support which I found difficult). 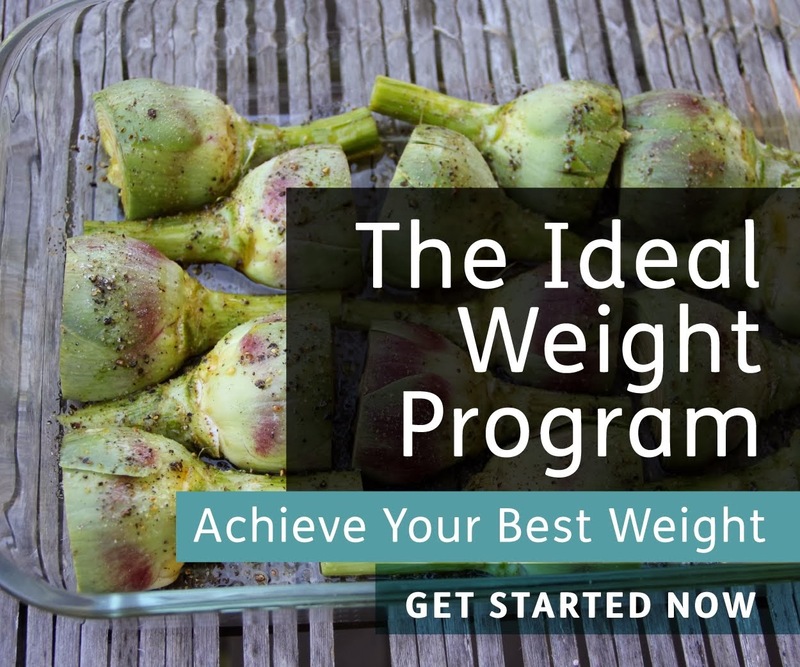 You'll need to realize you can't just eliminate those oh-so-handy fast carbs without coming up with an "exit strategy". You'll need alternatives and it will take experimentation, plus the kids' taste will change anyway. Sure, kids don't always get with the program, and if they know the sugar bombs are in the cabinet, they aren't going to listen to reason and have just a few or wait until the weekend like reasonable adults do (ha! ), they want them now and no, they don't want the sliced meat and the hard-boiled egg. My solution was to "run out" of the "compromise" stuff, like cold cereals, breads, crackers, pasta, and replace it less and less frequently. My son lobbied much less hard for foods that simply weren't in the house vs. foods on hand that I wanted to limit or reduce. That gave him the chance to get used to having other foods I deemed more favorable. First I cut back on the sugars in his foods, then bit by bit, the starchy stuff. I made his lunch for preschool/preschool, though even no, I don't make a big deal about stuff he eats at other homes or at school on occasion. Right now, he still eats most of his food prepared in our home. When I started this, he wasn't much of a meat eater, either. I think that's typical for small kids. They don't have great teeth for chewing it, and it takes a lot of chewing. I made a lot of chicken soup back then, because it as always a hit. With homemade broth in the fridge and freezer and a box of deboned chicken, all I had to do was heat it, dice or shred a carrot, and serve. If I added noodles at all, I put in a few of TJs sprouted wheat egg pappardelle. A couple years ago I got into the ease of slow cooked braised meat dishes (often with a slow cooker). The meat is very tender, very inexpensive, and takes very little active prep time (this technique can compare very favorably to "30 minute" dishes from Rachel Ray, once one gets organized to think about dinner hours or even days before, instead of when everyone is already hungry. I think kids can warm up to this meat very easily. You can pull some aside for kids without much of a "masking" sauce, remove any gristle that hasn't melted, and if made plainly, it can easily be made into completely different "planned overs" for another meal (or lunch). That's a great way to cook during the week or busy weekends. Now, at age ten, my son happily eats most meats, is very good at using his knife and fork, and often is more interested in the meat than the other foods (though he'll eat a dish of red pepper strips, carrot sticks, etc., while doing homework if I silently put them within reach. I wouldn't have imagined this just a few years ago. But it did take some effort and work, and wasn't a direct path. So be patient, be creative, and be vigilant to where you can cut back on availability of foods you deem less healthful and where you can insert better options, without a lot of battles. Keep us posted. tnn - yes, gluten does get through into breastmilk. There are some older studies about this. If you go to www.pubmed.gov and put 9867098 and 3300148 in the search for two such abstracts. I have met a few mothers who found their breastfeeding child's health improved when they stopped eating gluten. None of these children tested positive for celiac disease(flattened villi). I wish I had known this with my own child. He had such terrible colic. He is now gluten free and healthy. www.theglutenfile.com is a great resource. It is a collection of articles and abstracts concerning gluten sensitivity/celiac disease, related diseases, diagnosis, and nutritional problems. What do you think about steel-cut oats? I only soak them for a few minutes before eating them raw. Love them to death. My understanding is that there is minimal gluten in them just due to processing in facilities that also process wheat. True? Is the problem only gluten in wheat? If a person is not gluten sensitive, is a small amount of wheat (two pieces of high quality bread per day) still something to be reconsidered? Or is wheat problematic for everyone? Oats are generally considered a non-gluten grain. You eat them raw?? I'm not sure that's a good idea. I'm not aware of any culture that ate raw oats traditionally, and they can't be very digestible that way. The thing about oats that makes them different from most other grains is they're typically lightly toasted before you buy them. That kills the enzymes in it, so soaking oats is not as beneficial as soaking other grains. You can sometimes buy raw oats at health food stores, which should soak better. My feeling, from my reading, is that wheat is probably unhealthy for most, if not all people on some level. It's not just the gluten, although that is a big one. Wheat lectins besides gluten (WGA for example) are pretty nasty molecules. It's possible that some people do fine on wheat, but in my opinion it's a risk because the damage may not be obvious. I only soak the steel-cut oats because it softens them a bit. Yeah, you really have to grind/chew them. But I rather like that. I think I'm part horse! LOL. Seriously, though, if you think there's something even remotely unhealthy about that, let me know. I never really thought of that. I would definitely cook them. Cooking destroys some of the anti-nutrients in grains and hydrates the starch, making them more digestible. Thanks. Okay. I gather that the toasting before they're canned isn't sufficient? Any idea how long I'd need to cook them? Is bringing them to a boil sufficient? Thanks so much. In my opinion, the toasting is not sufficient. They aren't toasted much. I would cook them until they've softened, but how much will be a matter of taste. There was some very sound research into gluten intolerance published in the 90s from Italy. It did not get a lot of attention in the US because gluten intolerance was "rare." In 1999 the University of Maryland published results of a study looking for markers indicating celiac disease which suggested it might not be so rare. I agree that some foods like wheat, improperly prepared, may have a drug-like effect, causing the craving for more. Kind of like alcohol withdrawal symptoms, such as the shakes, improving initially by using more alcohol. Further studies at the UM showed gluten intolerance to be more common than thought. After this widely published study, gluten intolerance began getting noticed by the media, scientists and physicians. "Largest Study Ever Finds That One Out Of Every 133 Americans May Have Celiac Disease"
The physician who wrote the article linked below talks of how widespread gluten intolerance may have evolved over time. I don't trust what I've read on fermentation breaking down gluten and making it "safe." I think there are other factors at work which need to also be considered. At the point where someone has developed symptoms of gluten intolerance there may also be other intolerances that need to be eliminated for the gut to heal. Gottschall focused on digestion of disaccharides with the Specific Carbohydrate Diet. It helped my healing in some respects but other aspects of the diet I found harmful, or not well supported. What needs closer attention is inflammatory responses (the effects of making home brew in our guts) and eliminating their causes as well. Even if someone is not gluten intolerant at birth, I think it may be acquired by eating too much of a number of foods, not just wheat, and overloading the digestive system for too long. I've seen some of those papers; Italy seems to be at the forefront of celiac research. I think what you said about gluten intolerance possibly being a result of a number of dietary factors makes sense. I've thought about that a bit myself. Maybe the chronic inflammation caused by excess omega-6 contributes to that. Sourdough fermentation definitely breaks down most gluten, but are the resulting peptide fragments non-toxic? I don't know for sure, although there is research to suggest that celiac patients can eat properly fermented wheat bread without symptoms. I recently discovered the work of Dr. Ken Fine of EnteroLab. He developed a stool test for anti-gliadin antibodies that's much more sensitive than the blood test commonly used. He has seen a very high prevalence of elevated anti-gliadin IgG in autoimmune patients and people with chronic bowel problems. He claims upwards of 30% of asymptomatic people are gluten sensitive by his assay. Very provocative. I'll be posting on this soon. I hope you'll stick around and tell me what you think. The Italian researchers were ahead of the pack on celiac research by about a decade. I'm anxious to see your post on Dr. Fine's work too, especially in relation to bowel problems and autoimmune disorders. Neither the blood test nor the biopsy are conclusive in determining gluten intolerance. Maybe Fine's work will be a step forward. At one point I saw the Italian researchers criticized because their studies were focused on a particular region (i.e. it could be familial not culture\diet). But then the study at UM showed the disorder wasn't just familial or regional). I found two abstracts on fermentation breaking down the gluten which look very promising. "Use of selected sourdough strains of Lactobacillus for removing gluten and enhancing the nutritional properties of gluten-free bread." "Sourdough lactobacilli and celiac disease." We've go to wonder how many of the autoimmune and neurological disorders could be reversed or overcome by changing diet? I'm really glad to find your blog. The topics here are challenging and need to be discussed and debated. Just came across the article below today. Looks like Gluten can be degraded by making sourdough in a specific way. "Highly Efficient Gluten Degradation by Lactobacilli and Fungal Proteases during Food Processing: New Perspectives for Celiac Disease"
i get pretty bloated from pizza (deep dish style) & most bread. strangely, noodle soup & cake flour are ok.
since i stop having pizza & sandiwhich, my bloating is gone. so i maybe mildly gluten intolerant. There are a number a wheat varieties with differing gluten contents and therefore have different performance characteristics for making different foods. Perhaps it is the different wheat varieties with their differing gluten contents at issue for you. Yeast doughs that need to rise high and trap a lot of air bubbles need a very elastic high-gluten flour, so they are usually made either entirely or partially with hard winter or spring wheat varieties, which have a higher gluten content. When making "fast-rising" breads, such as with a home bread machine or in a fast-paced industrial setting, when a consistent, fixed time process is desired, it isn't uncommon for recipes to also require additional wheat gluten (read the "whole wheat" bread labels, added wheat gluten is very common). Low carb bread products also often contain added wheat gluten (and/or soy flour), which boosts protein content and dough performance when starch content is reduced. "Soft" wheat is used to mill cake, pastry, and all-purpose flours. Soft wheat varieties have somewhat less gluten than hard wheats. Pasta noodles and couscous are often made with semolina flour milled from hard durum wheat (or a soft wheat/semolina mixture). The gluten content is fairly high in durum wheat. Or perhaps it is the yeast bothering you and not the gluten. Enterolab (www.enterolabcom) can test for yeast sensitivity, as well as gluten sensitivity, (IgA antibodies) though your experiments and elimination diets can tell you a lot, too. I have Celiac and lactose intolerance, but I didn't develop either until 6 years ago. Prior to that, I was the pizza queen. Any kind of bread or cheese gave me such a pleasurable feeling when I ate it, that I had pizza for 2 out of 3 meals every day. I was addicted. Then I started getting really sick, I took out the gluten first, then afew years later got sick again and took out the dairy. I can't believe how much better and clearer my brain feels, kinda like I'm free from an addiction. cake, scone, muffin, cracker are ok (as long as i don't overdose in the sugar/carb department LOL). you're right that it could be yeast. In North India, rotis are the staple food and these are made of whole wheat flour. The fermented version is the naan. Both rotis and naans have been around for a very long time. Have the Indians been wrong all along? Anupama, is the flour of rotis & paranthas typically soaked overnight in yogurt or something? I've been trying to find a good book on Celiac and your review tells me I should buy Dangerous Grains. People in Germany have been eating uncooked oats for over 100 years, if not longer, usually in the form of 'Muesly', a combination of rolled oats and other rolled grains, nuts and dried fruit. It is often soaked in milk, sometimes overnight, and fresh fruit and yoghurt, milk or cream is often added just before eating. You can also eat it without soaking (my preferred way of eating it before I stopped eating grains; I also used to buy plain rolled oats and other grains to make my own combinations.) There are untold varieties of Muesly in any store that carries food items, and it is considered to be extremely healthy for you. I'm including a link to Wikipedia; it's mostly correct. What you should know is that you'll find cornflakes in only very few of the packaged combinations (after all, they're not raw), 'orange' juice on Muesly is not traditional, and, most of all, that it is popular all over Germany (I live in North Germany), not just in the South.